Autumn is coming, lets take out our fancy tea sets and homemade biscuits. Its tea time! 1. For jam filling, in a small saucepan, combine ½ cup of jam and cornstarch. Turn heat on medium and stir continuously until thickened, bubbly and clear (when you add cornstarch into the jam, the jam will look whitish and cloudy, but after awhile on medium heat, it will return to its clear color and this means your jam filling is ready). Set aside to cool. 2. For the cookies, in a large mixing bowl, beat butter with an electric mixer on medium for about 1 minutes. 3. Add sugar, baking powder, salt. Beat until combine. 4. Add eggs and vanilla essence and continue beating. 5. Add flour ½ cup at a time and keep on beating until all the remaining flour is well combined. You might need to scrap the sides of the bowl occasionally. 6. Divide dough in half and set aside to chill about an hour. 7. Roll half of the dough between two sheets of waxed paper into a square until its ½ inch thick. 8. Spread half of the jam filling over the dough and sprinkle half of the chopped walnuts. 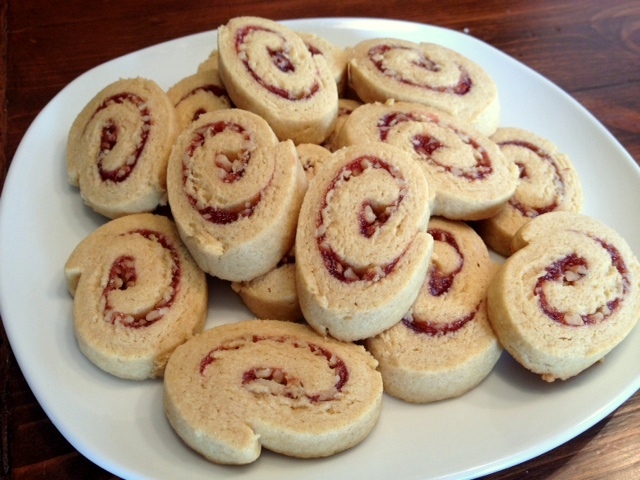 Roll up dough into a spiral. Wrap the rolled dough in waxed paper and chill for minimal 4 hours. Repeat with the remaining dough and remaining filling. 9. Preheat oven to 375 F or 175 C. Line baking tray with parchment paper, set aside. Cut chilled dough into ¼ inch slices. Place slices about 1 inch apart on the baking tray. Bake for 15-20minutes or until it turns golden.